Microdermabrasion treatments are performed by Dr. Phyllis J. Smith for patients from NYC. Long Island, Huntington, Woodbury, Melville, Northport, Hicksville, Halesite, Syosset, and Plainview to create softer, smoother and fresher looking skin. The answer might surprise you. It’s not facelifts or laser resurfacing, but a painless, non-invasive lunchtime procedure known as microdermabrasion. With microdermabrasion, you can have a treatment and return to work immediately. If you are unhappy with age spots, acne scars, fine wrinkles or flaking skin, you might want to consider microdermabrasion. 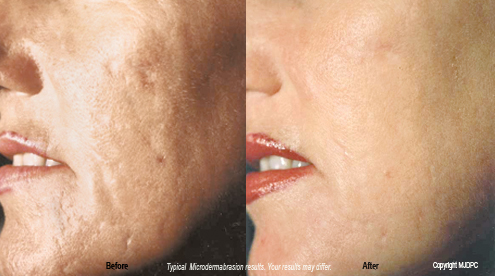 Microdermabrasion has been used in Europe for years. Now this exciting procedure is the number two non-surgical cosmetic procedure in the United States. It is helping men and women everywhere experience remarkable improvements in skin texture regardless of skin color. Treatments combined with our skin care products are a safe, comprehensive approach to skin care. Yes. It is non-invasive and only removes the outermost layer of dead skin cells to reveal the fresher, younger cells beneath. Regardless of your skin’s condition, fine lines and age spots may be erased and acne scars will become less obvious. 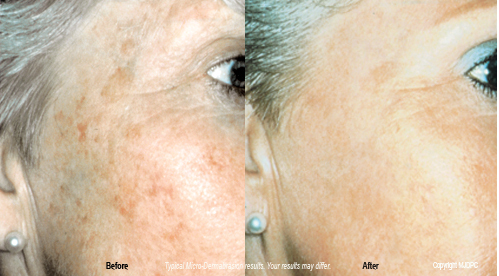 Microdermabrasion takes less time than other more invasive procedures. There is no recovery period, no discomfort and you can resume normal activities immediately. cannot take time off for healing from a chemical peel or laser procedure. don’t want to put off their outdoor activities like golf, tennis or skiing. Maintaining healthy looking skin is a daily task. Always wear SPF of at least 15 to protect your skin from the sun’s harmful rays. Keep your skin moist and fresh with daily cleansing and moisturizing using specially formulated skin care products. Ask your skin care specialist about recommendations for your skin care products. Dr. Smith recommends a monthly touch-up treatment to help maintain your results. Ask us about our money saving treatment packages. She may also suggest wrinkle injections to soften the appearance of wrinkles and frown lines. Treatments are not aggressive; they are slow and progressive, and best of all, they work! Most patients find microdermabrasion treatments to be quite relaxing. The treatment is like a “superficial skin polishing” using micro-crystals vacuumed through a delicate hand piece. In as little as 35 minutes, this gentle, abrasive technique efficiently produces satisfying results. Following the treatment, we may treat your skin with specially formulated creams to further soften and moisturize your skin. Treatments are applied through a course of weekly or bi-weekly sessions, ranging from 2 – 12 weeks. Immediately! After Dr. Smith performs your first treatment, your skin will have a fresh pink glow. It will look healthier and feel smoother and softer. Your improvement will continue throughout your treatment program.